Atom processors are more commonly found in netbooks, but Andrew Feldman, SeaMicro's CEO, says they can be more power-efficient than x86 chips for certain cloud and Web transaction workloads. Such transactions tend to be smaller in size but higher in volume. Other vendors have also been turning to alternative, low-power chips in servers. Dell has built servers around Via Technology's Nano processor for some of its cloud customers, and Microsoft's research group has built some experimental Atom-based servers. SeaMicro designed its new server, called the SM10000, with as few components as possible to save space and reduce power consumption. It has 512 miniature Atom motherboards, connected by a fabric that provides throughput of 1.28 terabits per second, the company says. Server motherboards usually include components for tasks related to storage and networking, but SeaMicro says it virtualized the I/O through an ASIC (application-specific integrated circuit). The ASIC emulates the hardware, which has helped eliminate "90 percent" of the components from the motherboard. 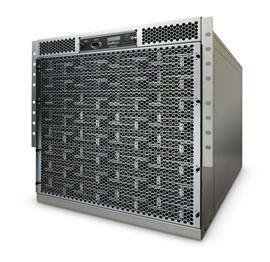 The server is 10 rack units high, or 17.5 inches, and includes storage and Ethernet switching. It uses Atom Z530 processors running at 1.6GHz. The server needs one-quarter of the power and space a traditional "best-in-class" server would need for the same workload, Feldman said. The Atom chips could be replaced by other x86 chips or by Arm-based processors, he said. "They have designed it for particular usage. By doing that they are able to have an architecture that allows them to use the Atom and divide workloads among a large number of processors simultaneously," Braunstein said. The server is good for specific types of Internet tasks, Braunstein said. Many data centers are running into power constraints. Servers like the SM10000 can help solve that problem while reducing energy bills, he said. The server is due for release July 30, priced starting at US$139,000. SeaMicro said some customers are already using the server, though it declined to name them.